Making profit from harvested organs and stolen station goods. Workplace of the quartermaster, located in the south end of the station. Avoid spacewalking outside, since crates will occasionally come flying through space towards or away from the cargo bay. There is a small pod bay next to the crate receiving area. There are no vents here. 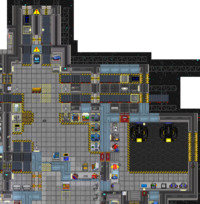 Though Cargo Bay is often called the Quartermaster's Office, on the power grid, they are considered separate areas; Quartermaster's Office is the area with the fabricators and quartermaster consoles while Cargo Bay is the area of conveyor belts below it. Quartermaster's Office APC is located in the maintenance tunnel left of it. Cargo Bay's APC is on the other side of the wall where the MULEbots are stored. Quartermaster's Office receives power through a cable in the same maintenance tunnel. Cargo Bay receives power through a wire in the door next to the MULEbots. Workplace of the quartermaster, located in the southeast end of the station. Avoid spacewalking outside, since crates will occasionally come flying through space towards or away from the cargo bay. There is a small pod bay next to the crate receiving area. The crate receiving area itself also has a nice utility tractor train just waiting to be ridden. Just be careful of the belts! The lobby area has an air injector that's connected to the Starboard Air Hookup. Keep a air tank on you anyways if you work here, because sometimes, when the Engineers are hellburning the engine, they like to put a hole in the Cold Loop to relieve all the pressure, which inadvertently depressurises Cargo. The APC for this whole area is near the conveyor belt into the Warehouse. There is a small pod bay south of the crate receiving area. 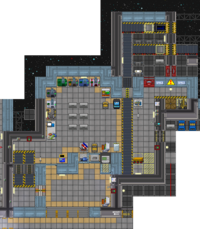 This wiiide open-space area resembling a real warehouse, that seems to draw inspiration from more  boxy stations, is workplace of the quartermaster, located in the south end of the ship. Avoid spacewalking outside, since crates will occasionally come flying through space towards or away from the cargo bay. Not only is there a sweet forklift and cargo tug here, but also a MULEBot for automated cargo delivery. If you need to reach out to more remote markets and vendors, there is a small pod bay below the crate receiving area. There are no vents here. Good thing the cargo flaps are airtight, right? 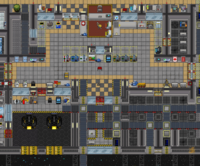 This wiiide expanse in the aft/north of the station is the Cargo Bay, or, as the quartermaster who apparently works here calls it, "Cargonia" and "a sovereign nation". Nation is a bit of a stretch, but it's definitely Crate Town down here. Crates of bees, booze, and bitchin' hats come in via the lower belt, are stored here until distribution, and are sent all across the station via manual delivery/forklift/MULEbot/cargo transporter. If Hydroponics just feels like chillin', or Mining just feels like explorin', don't be angry or try to break into somewhere. You can make some money yourself! (Or, obviously, if they are studious, make some more!) There's plenty of space for growing crops; you can get your plant trays from Hydroponics Starter Kits, and if you hop in one of the Space Pods and explore a bit around the Mining Outpost, you'll find a very good source of seeds. You also have a rainbow of manufacturers at your disposal, so you could, say, make robot arms to export or manufacture your own mining equipment and mine your own ores. There are no vents here. Good thing those plastic flaps are surprisingly airtight. The APC for the lobby area is in the maintenance tunnel above, while the APC for the Cargo Bay itself is in the maintenance tunnel below, accessible via the maintenance access door near the entrance into Cargo Pod Bay. 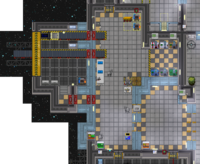 This wiiide room (perfect for starting a grow-op) in the northern parts of the station is the Cargo Bay, the workplace of the quartermaster. Crates of bees and booze enter via the lower belt and exit via the upper belt. Since this station came at a time before plastic flaps, the cargo shutter is just one huge hangar door for both belts, controlled by the switch in the northwest corner. Since this station also came before forklifts and cargo tugs, those two are absent. The ever-reliable cargo transporter and MULEbot are still at your service, however. You also have a rainbow of manufacturers at your disposal. There are no vents here. Better keep those airlocks close if you're going to leave the hangar open. 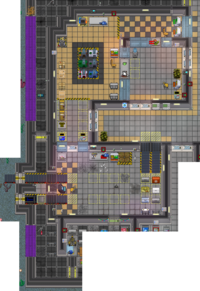 This great expanse near the Shuttle Bay is the Cargo Bay, the "kingdom" of its self-proclaimed "lords" the quartermasters, who insist this place is really called "the Sovereign Principality of Cargonia". Its "economy" is based around the production and procurement of various goods, some manufactured in a variety of "industries", some bought from foreign space markets via the lower cargo belt. Uniquely, this Cargo Bay is one of the few to use the old single-belt system. All goods are "imported" to and "exported" from the market via one long belt with two side belts in a small belt room in northern parts of Cargo. When the belt is moving down, it's ready to accept crates of goods coming in from the lower belt. When it is moving up, it is ready to send crates of goods to export through the upper cargo belt. The direction of the belt is controlled by a conveyor lever right of the belt. From there, crates and other goods are "exported" to the rest of the station in variety of ways, and each of the three QMs disagree on which way is the best. One espouses a simple but somewhat inflexible system of cargo transporters and teleporter pads; another favors a fleet of "high-tech" automated robots called MULEbots for delivering goods. The third prefers to hand deliver goods himself, usually via either forklift or Utility Tractor. There are no vents here. Must be what's causing this QMs to secede from the station. The APC for this area is on the right wall, near the switches for the cargo belt hatches. 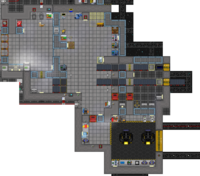 This vaguely L-shaped room in the northeastern parts of the station is the Cargo Bay, the workplace of the quartermaster. It's positively crate city here; there's nothing in this place that doesn't involve crates. Crates of goods for the market go out via the upper belt; crates of goods for the station fly in via the lower one. Crates are distributed throughout the rest of the station via cargo transporter and MULEbots. There's a pod bay with space pods for finding crates and other valuables in the Debris Field, and a rainbow of fabricators for manufacturing goods to stuff into crates for the market. There are no vents here. Good thing plastic flaps are surprisingly airtight. The APC for this area is on the left wall, near the door into maintenance. 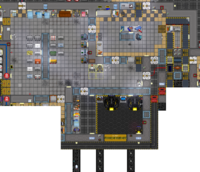 Don't be put off by this room's poor Crate Review System rating; the Quartermaster's Office in the southwest of the station is a fine place to be, whether you're a QM or one of their customers. The lower and arguably most important half is a cargo receiving and shipping area. Off in the right are two belts, the upper one for receiving crates ordered from the market via the QM consoles, the lower one for sending crates to sell to the market. Setup is remarkably easy. Just press the nearby buttons to lift the shutters, pull the top lever rightward so that cargo goes into your workplace, and pull the bottom lever leftward so that the crates you send can get launched by the mass driver. The maintenance area surrounding this lower area has a few tools and some more cargo carts for the tractor. The easiest way to get to them to enter the warehouse south of here, and take the western door. 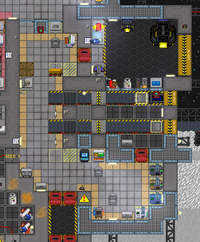 In the right of this lower half are several, mostly empty crates, a cargo tractor for deliveries, a cargopad, and another conveyor belt system. If you push the lever near the cargopad towards a certain direction, the conveyor belts moves up, and you can simply push crates onto it to deposit them outside the office. Push it in another direction, and people can now simply push crates through the flaps to deliver them to you. If you want to close shop, press the button above the lever to pull down the shutters. The upper half contains a few extra amenities that are officially unnecessary but highly useful for Cargonians. These includes lockers with spare uniforms and equipment, empty wooden crates, an aesthetically-pleasing array of desks and QM consoles, and a veritable sampling of the various fabricators and manufacturers of the station's departments. There's also a announcement computer off in the upper right, so you can tell the whole station just how good your wares are and what kinds of wonderful deals you're offering. There are no vents here. It's not like this is a vent office or anything. The APC for the lower half is in its lower right corner, while the APC for the upper half is left of the array of manufacturers. This page was last modified on 23 March 2019, at 21:24.